As a three-time world barbecue champion, Myron Mixon is the winningest man in barbecue. 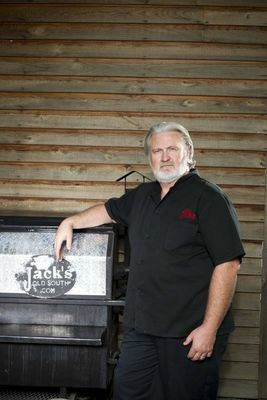 He is the chief cook of the Jack's Old South Competition Bar-B-Que Team, and the author of the New York Times bestselling cookbook Smokin' with Myron Mixon:, which was published by Random House. Myron competed in his first competition in Augusta, Georgia, in 1996, where he took first place in whole hog, first place in pork ribs and third in pork shoulder. Since then, he's won more barbecue competitions than anyone else in the world. He's won over 180 grand championships resulting in over 1,700 total trophies, 30 state championships, 8 Team of the Year awards, and 11 national championships. Myron's team has taken three first place whole hogs at the Jack Daniels World Championship Invitational Barbecue Competition; has been the Grand Champion at the World Championship in Memphis three times: 2001, 2004 and 2007; and, has also taken first place in the Whole Hog category at the World Championship in: 2001, 2003, 2004 and 2007. And, his team is the only one to win Grand Championships in Memphis in May, Kansas City BBQ Society and Florida BBQ Association in the same year. Myron has a line of sauces and seasonings, and custom-built smokers. He has made numerous national television appearances, including on the Tonight Show with Jay, Conan, ABC's Good Morning America, Leno, The Late, Late Show with Craig Ferguson, NBC's TODAY, and QVC; he's been featured on several television networks, including the Discovery Channel, Food Network, the History Channel, the Travel Channel, and the Versus Network; has been on countless radio programs and has been written about in many magazines and newspapers. He's currently working on his next cookbook and his restaurant (in Miami).